Going with the first idea.. I freelance regularly for a group of newspapers in the West Midlands/Worcestershire. My jobs arrive by email, with usually no discussion about picture requirements, with neither the organisers nor the organized. Not ideal, but that is the way it works (or doesn’t, occasionally). I’m not too sure what the photographic colleges would make of this, but hey-ho. Shitting in the dark again..
A fair proportion of the jobs I get are straightforward because of familiarity, and all that is required is a variation on a picture I did previously for a similar set up. Every now and again, a picture is suggested to accompany a story about whatever. There is no guidance as to what picture might be taken, just outline details regarding the job. The Mayor of Dudley organises a charity bash at the end of the year to raise cash for his chosen causes. 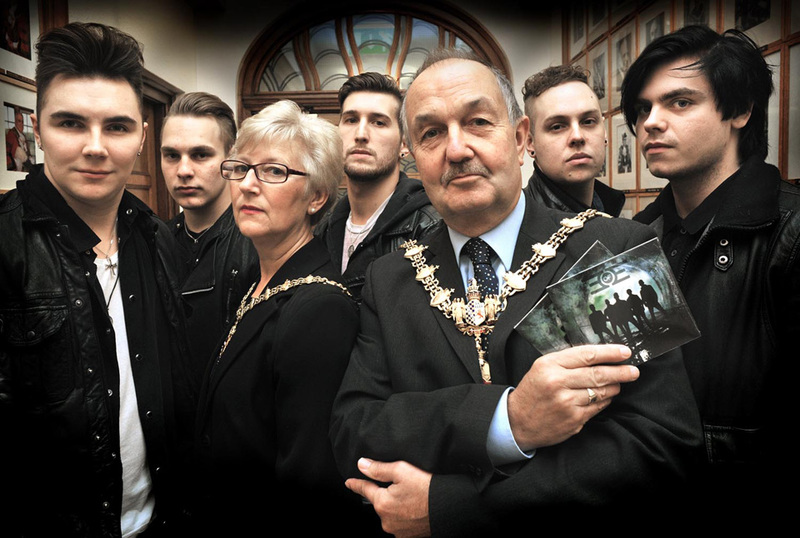 My jobsheet said mayor to be pictured with local band E of E (NOT East of Eden, oh no, definitely NOT. NOT.NOT. Ever…) Anyway they turned up, much, much younger than their 1970’s counterparts, at Dudley Council House. On the way to the job, I thought about what kind of picture I might take – considering I’d been given no guidance whatsoever. 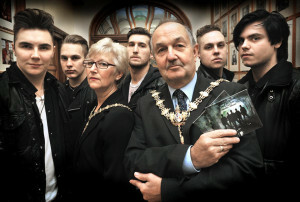 The very first idea I had was to pose the mayor, cllr Steve Waltho, as the front man in the band, with the other members doing a moody promo take around him. It was a start. At the Council House, interested parties were gathered. I asked if any kind of picture was laid on, was there a particular image they had in mind? It became clear that I was the only person thinking about what picture might be taken, given the various components available. Somebody was walking around holding the Black Country flag…I mean, honestly, what the doo dah had that got to do with anything? Any number of people had rows of zeros colliding across their brain, and nobody appeared to be owning up to the press call. Plan A won the day. In lieu of Plan B,C or D.
The Mayor and Mayoress were up for it, the band knew exactly what was required, and a two minute photoshoot gave the result. I could hardly call it planning ahead, but in the circumstances, it was fine. There is no copyright on ideas. I learned that a long time ago. The day after this, I had a job involving Worcester Warriors Rugby Club coaching primary school youngsters at Stourbridge RFC. Again, I thought about what kind of image I might aim for. It’s good to have an idea before you go, just so that you’ve got something to work towards if the actual job itself doesn’t provide obvious press pictures. Images of eight year old lads pitted against six and a half foot Neanderthals came to mind…this required the presence of said Neanderthals, naturally. Good job I ditched that one then. 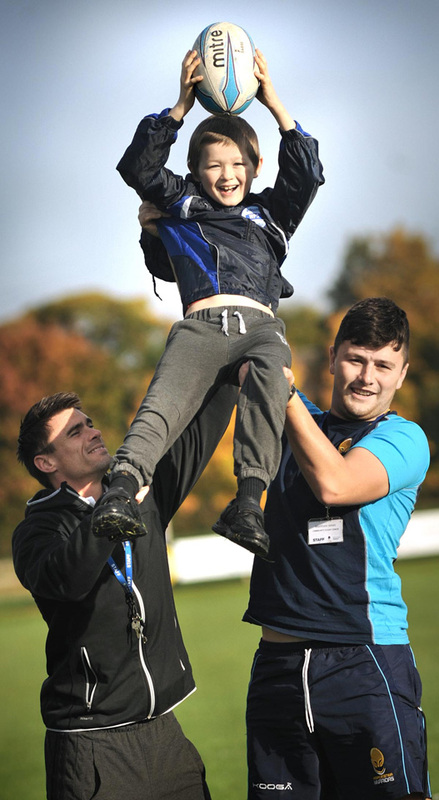 Another image that presented itself to me, highly achieveable, I reasoned, was a young pupil being hoisted up as happens in a line-out, by a couple of burly forwards. It turned out only one burly forward was available, so a mini-giant stepped into the role, and the pre-imagined picture was achieved. The young lad had a great look on his face, and a nice pic was the result. Nobody taking shots over my shoulder this time, so we’ll call it a draw. The lesson I reminded myself about here was pre-planning. Have at least half an idea what you want to do, have a good idea about how you might achieve it, then you might not have to resort to nicking another photographer’s idea.